Humility. 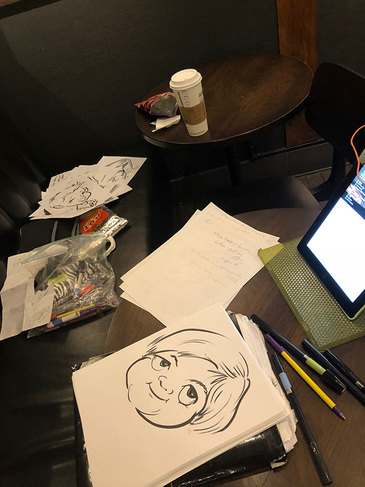 I felt inspired by the way I recently organized my approach to Digital Caricatures, so I felt inspired to organize my approach to Caricatures Drawn with Markers. I used to consider that 'filling in the blanks', not 'real art'. Feeling like I Must Be Better Than That in order to be a Real Artist. But it only makes sense. So I'm not 'taken by surprise' each time I start to make a Drawing. Turned out that I could only tailor it down to 3 Different Approaches. Outside-In, Inside-Out, and Exaggerated. I pretty much only felt successful with Outside-In and Exaggerated. I'm figuring that Outside-In is more suitable for Events like Communions, and Exaggerated is the way to go for Teenagers and Grown-Ups. Probably just a good Starting Plan at Events. Because the experience of actually using these different approaches was different than expected. After several Successful Caricatures with one type of approach, I felt burned out on it. Didn't like what came out anymore. But if I switched to the Other Approach, the pictures were fresh again. And either way, I had to be doing Warm Ups as usual ~ to keep my lines Fresh.